Justin Trudeau is facing the most explosive crisis of his administration after his former attorney general detailed a months-long campaign by the Canadian prime minister’s office to quietly end a legal problem for an iconic Quebec construction firm. In dramatic testimony that lasted nearly four hours, Jody Wilson-Raybould broke her silence with a detailed account of efforts by Trudeau and top aides to persuade her to step in and end prosecution of SNC-Lavalin Group Inc. She argues it amounted to interference in the judicial system, though concedes it wasn’t illegal, while Trudeau says he was trying to prevent job losses in his home province of Quebec. “I experienced a consistent and sustained effort by many people within the government to seek to politically interfere,” the former attorney general said Wednesday afternoon. Wilson-Raybould, who quit cabinet this month, also said she faced “veiled threats” about what might happen if she refused to order an out-of-court settlement. Her testimony shook the core of the Trudeau’s team, naming him, his finance chief and his most senior aides. The Conservative leader trying to unseat Trudeau in this fall’s election called for his resignation, but the prime minister stood his ground and rejected Wilson-Raybould’s version of events. The public airing of grievances will inflame the scandal, which has driven the governing Liberals lower in national polls. The ordeal dredges up ghosts of the party’s past, which is marked by hand-in-glove ties with corporate Canada — particularly in Quebec. The political fallout, however, is difficult to predict. Trudeau’s path to re-election runs through the largely French-speaking province, where his defense of SNC-Lavalin is being applauded. SNC-Lavalin had been pushing for what’s known as a deferred prosecution agreement to end a criminal case dating back more than a decade, related to corruption charges. The company’s stock plunged the most in six years Oct. 10 when it revealed that the Public Prosecution Service of Canada ruled out a negotiated settlement that would have staved off a trial. Settling out of court would also help the company, which employs about 9,000 people in Canada, avoid a ban on bidding for federal government contracts. 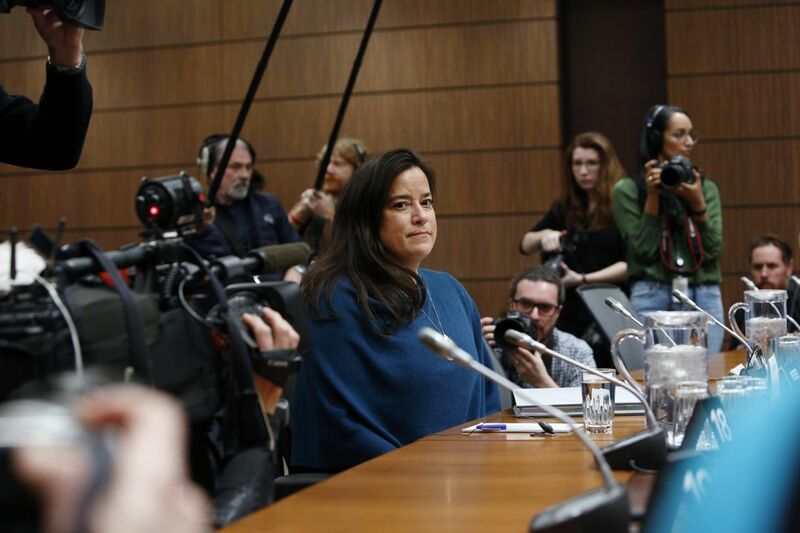 Wilson-Raybould pulled back the curtain on the effort to change that decision and help the company, in testimony that was aired on national television in its entirety. She spoke to lawmakers only after Trudeau waived privilege to allow her to do so, and believes she wasn’t even legally able to intervene. She said the prime minister and his aides wanted to end the case in part to prevent the company’s relocation — and also to avoid electoral fallout for both the federal Liberals and the party’s provincial wing. Wilson-Raybould said she resisted intervening because she wanted to uphold the principle of judicial independence and the rule of law, but officials ignored her repeated instructions to stop raising the issue. The former attorney-general identified a series of phone calls and meetings between her or her staff, and Trudeau or several of his top advisers. They include chief of staff Katie Telford; former principal secretary Gerald Butts, who resigned this month; and senior aides Mathieu Bouchard and Elder Marques. She also cited communications with Finance Minister Bill Morneau and his chief of staff Ben Chin. One of the meetings was with Trudeau himself, in September. “The prime minister raised the issue immediately. The prime minister asked me to help out, to find a solution here for SNC,” Wilson-Raybould said. She said she’d told him she had made up her mind. “The prime minister again cited the potential loss of jobs and SNC moving,” while also stressing that he represents an electoral district in Quebec. She said Privy Council Clerk Michael Wernick, the country’s top bureaucrat, also warned her the company “will likely be moving to London” without her intervention. Conservative Leader Andrew Scheer, who is Trudeau’s top rival, demanded the prime minister step down over the revelations. Jagmeet Singh, leader of the third-place New Democratic Party, called for a full public inquiry. Wilson-Raybould was ultimately moved in a cabinet shuffle last month, before the scandal broke. Trudeau at first sought to downplay it by saying Wilson-Raybould’s presence in cabinet should speak for itself. She resigned the next day. To be sure, she said she didn’t believe Trudeau or his aides broke the law, but that their interventions were inappropriate. Wilson-Raybould also said no one ever flatly directed her to intervene. Trudeau has echoed that. The former attorney general said she didn’t think it was inappropriate to discuss the potential of job losses early on, but became inappropriate to continually do it, and to raise the political ramifications of the situation. SNC-Lavalin has said it’s no longer focused on getting a remediation agreement, but instead on fighting the case. It’s also facing legal proceedings that allege it delayed disclosing that it would not get an offer of a deferred prosecution agreement, from Sept. 4 to Oct. 10. SNC-Lavalin said Wednesday the prosecutor’s “final decision” was only made Oct. 9.